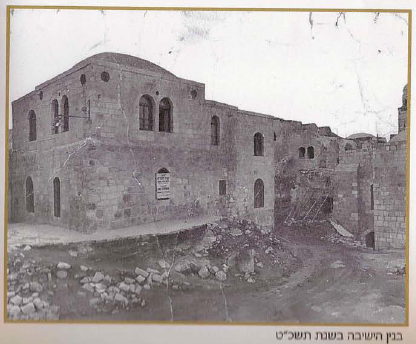 In the tiny Tel Aviv of long ago, between houses that grew and were developed, expanded and were widened, between its full streets of the synagogues and Batei Midrash of many Admors and Rabbis, stood in its glory the home and Beis Midrash of Rabbi Yehuda Tzvi Brandwein, the Admor of Stretin ZTZ"L, who came to live there in the year 5701 from Jerusalem, the Holy City. Rabbi Yehuda Tzvi ZTZ”L and the Rabbanit Leah of blessed memory had six daughters. On the 16 of Iyar in the year 5705, the family's happiness increased greatly when a child was born to the older parents, with great happiness and joy was arranged his bris mila at the appointed hour, at a good and successful time, under the supervision of important rabbis, among them Rabbi Yehuda Leib Ashlag, the "Baal HaSulam," who besides being the quintessential teacher of Rabbi Yehuda Tzvi was also his brother-in-law; the Rabbanit Leah was the sister of the wife of the "Baal HaSulam." Naturally, it was taken for granted that the great uncle, who had arrived from Jerusalem specially with a group of selected students, would be selected to serve as Sandek (Godfather). The brother of the blessed holy Belzer Rebbe from Bulgaria was honored with saying blessings, the Mohel was Rabbi Baruch Rabinovich from Munkatsch, Z"L. In days to come, they would speak wistfully of how special that bris mila had been. The infant who had been circumcised was called by the name of Avraham, in the name of his ancestor the great Tzadik Rav Avraham Brandwein from Safed ZTZ"L, who was called by all, "Rabbi Abromtchi," who was the crowning glory of the houses of Stratyn Valik, the scion of the great Chassidic leaders, the esteemed rabbinic dynasties and important Hassidim from Safed as well as Hassidic elders bore witness to the fact that the radiance of his face reminded his elders of the holy spirit of the Holy Rebbe, Rabbi Avraham from Stratyn. His parents' home was known as an open home to all those who were in need, a home full of holiness and the work of Hashem in self-sacrifice, and there in the home would gather students every day in the early morning hours, diligently studying hidden Torah secrets, with an atmosphere of righteous devotion, suffusing his body and spirit even at a very young age, of tender years. His parents guarded over him as the apple of their eyes, in order that he would grow up and become perfect in every correct attribute, all the wellsprings of his father were given over to “Avrimul”, the young boy. At the age of five he was sent to study in the Talmud Torah of Chabad in Tel Aviv and from there moved on to study in the Talmud Torah “Yesodei HaTorah” (Foundations of Torah). Later, he continued to study in the yeshiva of “Heichal HaTalmud” in Tel Aviv and later on, in the lower yeshiva of Slobodka and the yeshiva of Ponovezh. Already from his youth he was inclined towards his own blessed skills, and especially with memory and wonderful, clear and precise insight. When he was 14 years old, he would read the Torah so pleasantly, and with such great precision. Over the years, many desired to come and hear him reading the Torah that he was reading every single Shabbat. He was well-versed in all five books of the Torah with the cantillation notes. He knew by heart many of the studies of the Mishna that were arranged in a clear order in his rare memory. 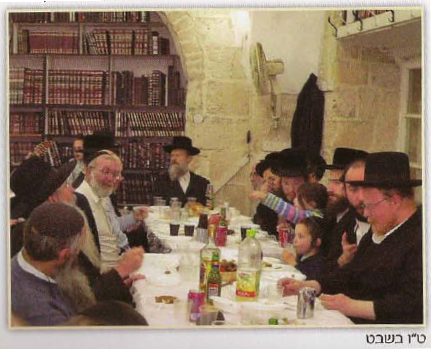 While still a youth, he was sent by his father to study in the “Amshinov” yeshiva in Jerusalem and soon grew fond of the Rebbe there, the Admor from Amshinov, ZTZ”L, and also towards the head of the Yeshiva, the Gaon Rabbi Chaim Milkovsky ZTZ”L, and according to the Admor from Pinsk Karlin Shlit”a - who had learned with him – he was nearly the only one who had succeeded in keeping focused mind during the entire lesson of the Gaon Rabbi Chaim, who was known and renowned in the depths and his esteemed insights. Rabbi Chaim continued in his wonderful closeness with him and the deep connection with him over many long years, and at the time that he moved later to the old city Rabbi Chaim would travel to him for Shabbat, “entertaining” one another with words of Torah and the service of the blessed Hashem. 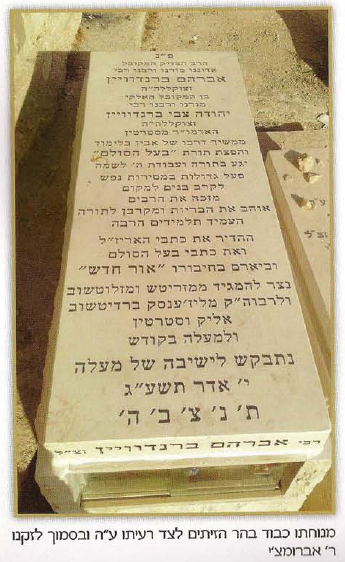 During his youth, our teacher ZTZ”L withstood the “furnace” of testing by the head Yeshiva of “Chayei Olam,” the righteous Gaon Rabbi Shlomo Schreiber, ZTZ”L, on matters of what was prohibited and permitted, and also participated in lessons on the service of Hashem for young men which were given by Rabbi David Mintzberg. His great father who was the student and brother-in-law of Rabbi Yehuda Leib Ashlag, the Baal HaSulam, would also take his young son, even while he was still a child, to absorb the holy atmosphere during the lessons and at the tables that were laid out for the company of his tudents and followers. There he absorbed into his body and into his young soul the holy spirit and exalted atmosphere of working arduously and the spirit of drawing near the hearts and being occupied with helping his fellow man, as well as dedicating one’s life and soul to the study and spreading of the Torah. And despite the fact that he was still a young boy, he merited to be close to the greatness of the great uncle, ZTZ”L. During these years, he merited to see and enjoy the radiance of many Admorim in Tel Aviv and in Jerusalem, who were in constant contact with his great father, and especially with the great and holy Belzer Rebbe and the Admorim from Sadigura of blessed memory. 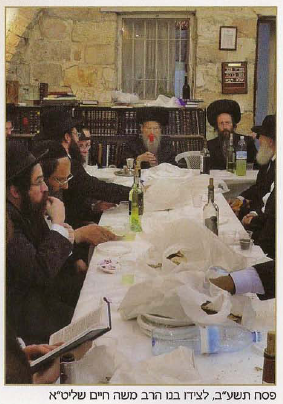 On Chol Hamoed Pesach 5726, through matchmaking connections, arrived his wife, Tzipporah of blessed memory, daughter of the learned Rabbi Aharon Zeltzer, author of the volume, “Zooda Klila” and son-in-law of the righteous Rabbi Moshe Samet from Jerusalem. Rabbi Aharon was an extremely wise student who was known to never cease learning Torah, a true servant of Hashem in his own special manner, one of the greats who came out of Hungary and among the selected students of the learned Rabbi Yosef Asher Halevy Fallek, leader of the holy court of Verpelét. He would get up every night at midnight in order to weep over the tragedy of the exile of the Holy Presence at the time of Tikkun Chatzot (midnight reparations) and would continue his studies until the early morning prayers. And in the days of the “shovavim” (weeks during the reading of the portions in the book of Shemos) he would increase his fasting and afflictions. The wedding took place at the fortuitous hour of “Tu b’Av” (the 15th day of the month of Av), in the Devorah Hotel in Tel Aviv with the participation of many Admorim, Rabbis and representatives of the community. After the wedding, they moved to live in Bnei Brak in order to be nearer to the holy court of his father in Tel Aviv, and every Shabbat he would walk from Bnei Brak to Tel Aviv to the Beis Midrash of his father. There, he would read from the Torah most pleasantly, and stand at the right hand of his father in all that was connected with spreading Kabbalah wisdom, together with him laboring to print the books and glorious writings of the Ari Z”L. In those days, he would learn in the Volozyn Kollel near to his home and was ordained to the rabbinate. In the year 5729’ when his father moved to live in the Old City of Jerusalem and established there the yeshiva of “Kol Yehuda,” he requested that his son would continue to lead the Beis Midrash in Tel Aviv. Maintaining the yeshiva was a heavy burden upon him, and it was necessary to discover and go out to attain funding and financial sources to maintain the yeshiva. For that reason, he traveled to Europe to solicit donations. While there, he merited to become exceptionally close with the great and holy Rabbi Itzikl from Pshevorsk who also stretched out his hand to help and to aid the yeshiva, however, the burden was too great to carry, and thus he decided to give up the yeshiva and return to live in Bnei Brak and continue to study in the Volozyn Kollel. While living in Bnei Brak, his soul was yearning even more deeply to study the wisdom of Kabbalah. He dragged himself to study and listen to the lessons of the Admor Rabbi Baruch Shalom Ashlag ZTZ”L. This great man loved him deeply and honored him in an exceptional manner. He was ‘thursty’ for kabbalah studies and eagerly studied other books of Kabbalah. For a long period, he would regularly study with HaRav Moshe Tzuriel, author of a book on the Ramchal, who lived near him in Bnei Brak every day from two in the morning the book “Pitchei Shearim”, (gates’ openings). His great knowledge of volumes of Kabbalah and especially the works of the “Baal HaSulam” became his byword, through his exceptional ability to remember everything he had studied. For the first time, he printed the book “Matan Torah” (gift of the Torah) of the ‘Baal HaSulam,” and then reprinted all the works of the Ari after he had corrected in them hundreds of errors, and then completed improvements to the edition of the book “Pri Eitz Chaim” of the writings of the Holy Ari. Word of his quality began to spread and be publicized, and people began knocking at his door who wanted to learn with him in order to enjoy his wisdom and great and deep knowledge, and then he began to teach others. In the year 5739 he decided to move again to Jerusalem, to continue there his studies and teacher with the students who came from the central area, and even more who came in order to be counted among those who merited to hear his teachings. When it became difficult for one of his students to come every time the center of Jerusalem, our Rabbi ZTZ”L advised him to go study with Maran the Rabash from Bnei Brak, and thus he did. At the time that he was sitting in lessons there, he would from time to time pose good and difficult questions, and Maran the Rabash, noticed that he had a “full vessel” and that his knowledge in these studies was very good. He turned to ask him from where this excellent knowledge had come in these studies, and he replied that he was among the students of HaRav Brandwein. 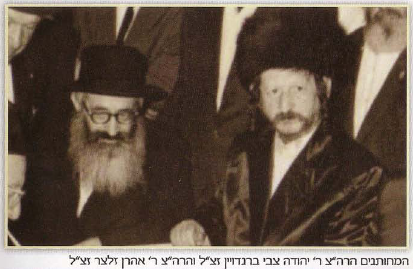 Maran the Rabash was filled with admiration and requested that he also desired to study together with HaRav Brandwein. From then on, they established a regular study together and in the lessons the Rabash loved to let him read aloud from the book and to explains that in the answer was already found in his reading. And he even said later that Maran the Rabash opened for him new horizons in the study of Kabbalah. He merited additional closeness with the great and holy rabbi the Baba Sali ZTZK”L, while he was visiting with him, and found him interested in the holy Zohar with the commentary of the “Sulam.” He asked him, “What is the interpretation of this?” and he said, “It is all beauty!” – it is all sweet, and all those who speak against it don’t know what is written within it. He said to him that ‘Baal Hasulam’ was his uncle. Then, the Baba Sali asked a blessing from him. When his family began to grow and the yoke of earning a living weighed heavily upon him, he was advised to serve in a position as a rabbi with the Jewish Agency in the department of absorption together with Rabbi Abraham Wilhelm and Rabbi Shammai Ginzburg. He accepted the position and saw in it a great mission, and happily served in his role with faithfulness, and he had the satisfaction that this position was similar in its theme to the work his father had done as a rabbi of the Histadrut (labor union), and he was able in this way to satisfy the religious needs of the people of Israel and especially those of new immigrants, who were far from the basic ideas of the faith. Indeed, he was successful in carrying out much for the people of Israel, cared about drawing Jews closer to their father in heaven, and was responsible for the fields of kashrus in the immigrant absorption centers, and worked for matters of conversion, arranging circumcision for children of immigrants throughout Israel, and distribution of holy books, mezuzahs and tefillin, bar mitzvah ceremonies, weddings and more. In these matters, he would also consult with leading poskim (Scholars in Torah laws) of the generation and was received with an open door by these rabbis. Later, when aliyah (immigration to Israel) lessened along with the activities in the Jewish Agency, together with the fact that serious and severe halachic problems had begun to emerge among olim who had come to the land, it was the Rabbanit (his wife) who recommended to him to leave the position, in order that he would be free to continue his studies, and she decided to go out to work in order to support the home. From that point, he began even more to teach in many groups in his home and in the Beit Midrash. He would also travel to give lessons in additional places in Israel, such as in Hebron and in the yeshivas of Admor the great Rabbi Ashlag ZTZ”L. As mentioned before, right after the passing of his father Rabbi Yehuda Tzvi, while he was still a young scholar, he accepted upon himself to continue the activities of his father, and over many years he led his Beis Midrash and his community in the Old City of Jerusalem. Over the years he developed and broadened “Heichal HaTorah” (Sanctuary of the Torah) and over the years, many merited to study in this yeshiva. Besides the wise students and thinkers in the wisdom of Kabbalah, in his shade were also sheltered many people who sought closeness to G-d and desired to taste the essence of Judaism. In this way, hundreds merited to accept upon themselves the yoke of the Torah by the merit of his many activities. He knew with his special senses and his sharp eyes to discern those who were not fitting to enjoy the glow of his Torah. He knew how to scold his students for their misconduct and put them on the right path. Altogether, he knew how to guide those who were returning to the faith in the proper steps and with additional caution, and he would encourage and even obligate them to continue in making efforts, because it was the most laudable path. Students would come to his lessons from all over Israel, and so too would he travel throughout Israel to give lessons. Also when he would visit the U.S., many would come to hear his lessons and also to receive his advice. His advice was considered so discerning that many would not take a single step without consulting with him. His trait of Ahavas Yisrael (love of fellow Jews) was very great, drawing near every person who was a Jew. Those who drew close to him saw within him a merciful father who was open to listen and to pay attention to all of their problems and troubles, and despite his greatness in Torah knowledge, would bring himself down the level of the people and to each and every one individually. More than once it seemed that he was sitting for lengthy periods with people who supposedly it was not obvious that he would be seated with. So too he would treat every youth and young boy and reward them with his full attention. He knew how to lead and to straighten the lifestyle even of those who were far from even the slightest dealings with matters of Torah and service of Hashem. Every person who came through the doors of his home or his Beis Midrash merited great attention from his side. He was interested and would ask about every misfortune and about every details, and he would care and join in the sorrow of others, not only for those who regularly prayed or studied with him, but also every person who entered, even at random, and would also remember every event and every “Yahrzeit” (death anniversary) of those who prayed there. He would always arrive before those who came to pray in order that none would have to wait for him, organized and exacting. His clothing were spotless. During the days of the mourning period, “Shiva,” a Jew entered the house and related a story about himself that over the years he had hardly entered into a synagogue and had not prayed. However, when he saw the Rav on his way to prayer, watching him with his fatherly, compassionate eyes and felt that he was “sucked” into the place. And since then almost every day he would enter to pray Mincha (the afternoon prayer). He was not the only one. Over the days of the “Shiva,” many different Jews came up and entered and in tears would sob that our Rav was for them the only “address” in their world where they would be listened to and heard, and that he had been a support for them. A young man whose family had belonged in the past to clear and well-known Hassidic roots, but he had lost contact from them in his youth, and had become almost completely distant from the faith. One day, he turned around and arrived in the Old City and met one of the students of the Beis Midrash. When he heard from him that there was there a warm Hassidic corner, he decided to enter and to check out, with suspicion and caution, the place. Not much time passed and he started to feel a deep internal connection to the place. He remembered from his childhood the special melodies. The existence and the exalted atmosphere which always suffused the Beis Midrash filled the young man with a deep desire to return to his source, and he began to connect further with the place. Many returned from iniquity, which is the correct and true definition of our Rav ZTZ”L’s way of life. He merited to draw near and to return to the faith many, some of whom he brought out from the very depths of impurity, and from the Vale of Tears, people far distant from Judaism were influenced by his exalted spirit and changed their ways, clung to Torah and accepted upon themselves the yoke of the commandments. He merited to marry and to establish and to uphold generations and families in Israel to conduct themselves by the foundations of Torah and fear, and they all saw him as their leader and teacher on their journey. Despite the broad scope of his activities swarming all around him, he would always conduct himself with modesty and humility without any type of publicity. He loathed every type of superficiality or lie. He wouldn’t allow people near him to make issue of him. Because of his great humility he wouldn’t let others near him to deviate from this approach. One day, a weight was upon the hands of the Rav Chezkiyahu Navnatzel Shlita to give a lesson in the “Ramban” synagogue. The Gabbais (synaguougue administrators) hung in his synagogue a notice to publicize the time of the lesson and created elaborate descriptions for it. After a number of days, they noticed that from the notice had been erased the descriptions that they had written upon it. After investigating who would dare to besmirch his honor, it became clear that it had been he himself who had erased what was written. In his gentle and noble way he succeeded in becoming beloved to all, all his neighbors and acquaintances knew him as a great man and all in his spheres observed strong relationships and especially friendly connections. Indeed, you could see that in his Beis Midrash people praying from all the circles of residents of the Old City and beyond. He would also honor every one from every circle and community. He wouldn’t let the leader of the prayers to continue with the repeatition of the Amida prayer until most of the congregation had completed their prayers. We could learn a lesson in “Mussar” (spiritual moral codes) and receive guidance from his preparation and desire to fulfil every Mitzvah. Before Shabbat or holidays he would prepare himself entirely and would enlist all those around him to participate in the pleasantness of the mitzvah. Every Thursday, one could feel in the air Shabbat approaching. In his home, everything was already prepared, and he would occupy himself entirely with preparations for Shabbat. The Shabbat foods were supposed to be ready by Friday night and he would ask everybody to assist him with adding honor for the Shabbat. In his great anticipation for Shabbat drawing near, he would sleep a little less on Thursday night. If he would get up every night after midnight, then on Thursday night, he would get up even earlier, even before the family members finished their work. He would start his day – a Friday full and replete with preparations for Shabbat. After he would finish more preparations at home he would turn to his Beis Midrash and there give a deep lesson in the holy Zohar from the weekly Torah portion. The atmosphere on Friday mornings was different in the yeshiva from the rest of the days of the week. After prayers he would give a lesson in Hassidic thought from the ideas found in the weekly Torah portion. To this lesson would come many young people whose souls desired communication and to feel the loveliness of Shabbat drawing near, and after the lesson, they would sing and chant Shabbat melodies in happiness and devotion to Hashem. He would never give up on any single custom of the customs of his ancestors, even if it cost him dearly or came only with great self-sacrifice. All the ways of his home and every detail of the Shabbat table were in the ways of his holy ancestors. The atmosphere at the time of the Shabbat meal was elevated and sublime indeed. He would sit in awe and holiness and would almost not converse at all except for words of Torah. He would sing Shabbat songs with sublime devotion to Hashem, being careful to be correct in every detail while singing the Zemiros (Shabbat songs) which had been established by the holy Ari Z”L and in the melodies of the “Baal HaSulam” ZTZK”L. In the last months of his life he would place in front of himself 12 Challahs (Shabbat breads) braded exactly according to the way the wife of the “Baal HaSulam” ZTZK”L had braided them for her husband. The braiding was according to special numbers based on the secrets of Kabbalah. He expressed on one of the last Shabbats of his life that now he had attained the correct intentions and inner matters of the 12 Challahs. Everyone who ever merited to participate in his Shabbat meals knew to indicate the holiness and the elevation that could be tangibly felt there. Guests couldn’t tear themselves away from watching him during every Shabbat meal. On Shabbat, he would rest a few of hours in solitude. and a little after midnight he would begin his Torah studies. 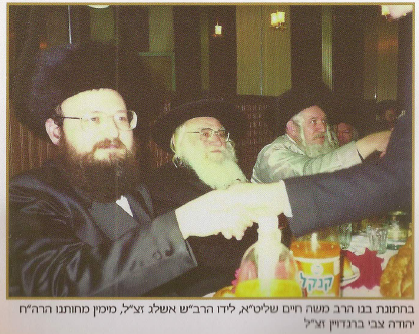 For years he would study in the holy Zohar with his brother-in-law, Rabbi Shlomo Fash Shlita, who was dedicated to him with every fiber of his being. After that he would go down to pray at the Western Wall the Shacharis (morning) prayer with sublime devotion, in a regular minyan in which he would read the Torah for many long years. People came from distant areas especially to join in this minyan only in order to hear his extraordinarily precise and clear reading. 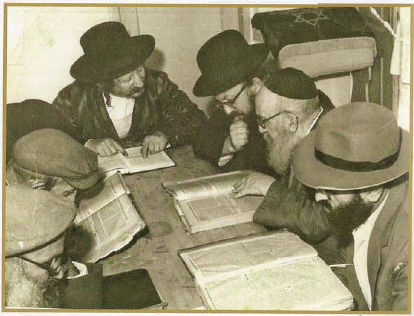 After prayers at the time of Kiddusha Rabba (the Kiddush of the day), he would from time to time give lessons on topics related to the weekly Torah portion. The time of ‘Ra’ava De’ravin’ (third meal of Shabbat when the goodwill of the Creator is revealed) in his Beis Midrash was famed and well-known to all. One could feel the sublime moments of this special time of grace. With devotion they would sing the Zemiros and at their end would speak wonderful sweet words from the “honey” of the lessons from the weekly Torah portion. Sometimes, he would speak very deep words that only a few merited to bring down to the depths of understanding, and all yearned to listen and hear every single word that came out from his mouth in its brilliance and clarity as if it was given from Mount Sinai itself. Beginning with the summer months he would already start to speak of the coming months of Elul and Tishrei which were approaching. There were years that his preparations for the High Holidays were great due to the large congregation that was coming to pray, and in certain years they would rent a broad and large place for the prayers. Those who were rarely seen coming to pray during the year would never give up on prayers for Rosh Hashanah and Yom Kippur, and every year they were regulars in the minyan. His warm and meritorious prayers awakened all in repentance, their precise and thrilling style out of tears and pleas saturated within them throughout the entire year. Even in the final year of his life he didn’t give up and approached the pulpit with almost supernatural strength and prayed almost the entire prayer service before the pulpit on Rosh Hashanah and Yom Kippur. The entire period of the 10 Days from Rosh Hashanah to Yom Kippur, from the first Selichos until the Selichos of the eve of Rosh Hashanah which are said in the early morning hours, the prayers, the blowing the shofar, and all the work of the Ten Days of Repentance were a single challenge in elevation and devotion. And rising above it all was the work of Yom Kippur, the holiest day in the year, when could be felt well in his surroundings, and especially because it was also at that time the “Hillula” (Yahrzeit) of the “Baal HaSulam” ZTZK”L. In every moment, the spirit of devotion to the blessed Hashem and the holy rabbi (Rabbi Ashlag), never left him. Over the years he cared about repairing and cleaning the ‘Ohel’ over the burial place of Rabbi Ashlag. With the end of the holy day of Yom Kippur he would arrange with joy and happiness the “Hillula” feast and speak of the greatness and elevation of the holy Rabbi Ashlag ZTZK”L. Shortly after he would begin occupying himself with preparations for the festival of Sukkot. It seems as if the preparations for the Sukkot holiday were never ending. Every single moment he would think how to glorify and elevate even more the Sukkah, and his thoughts were gripped with performance of the mitzvoth, how he could carry out with even more praise this year the mitzvah of the Sukkah and its decorations. He would make a supreme effort to ensure that he could enter the festival with joy and happiness. So, too, with the Four Species, he would choose with great care the responsibility of “zeh eili v’anveihu” (“this is my G-d and I will exalt him”), he didn’t think twice about the expense, only of doing all that he could to add glory to the positive commandment in haste and with desire and yearning. While he was sitting in the Sukkah on the first night and so too during all the days of the festival, one could feel the pleasure that he would experience from the holiness he was absorbing in every moment he was in the Sukkah. The holiday meals, the singing, praises and the Torah lessons that the people would hear from him during the holiday were made with happiness and elevated spirit. The essense of every holiday was felt around him. When the day of Hoshana Rabah arive, it was truly felt that it was the day of sealing of the judgment for the next year. When the night come he stood to read “Mishneh Torah.” (book of Deuteronomy). To this reading came many people, even from afar, they gathered and came, all of them waiting and eagerly desiring to hear again the precise reading that came out of his mouth with brilliance and clarity. 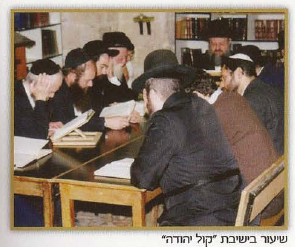 The Rama”ch Shlanger Shlita, the spiritual leader from the “Porat Yosef” yeshiva, related that he used to come for the reading of “Mishneh Torah” because he had seen in the name of the Gr”a that the best moral book was “Mishneh Torah,” and believed that when he hears the reading of Rabbi Avraham, people would feel it well. Despite the fact that he needed great strength for this reading, he didn’t give up on it. Later, he would begin a lesson about the inner essence of the day. With sunrise would begin the prayers and work of “Hakafot.” of Simchas Torah. It was a day of happiness and joy in the most special fashion. The dances and the “Hakafot” were arranged with the elevation of rejoicing with the Torah and one could feel the spiritual elevation with the joy of Torah. 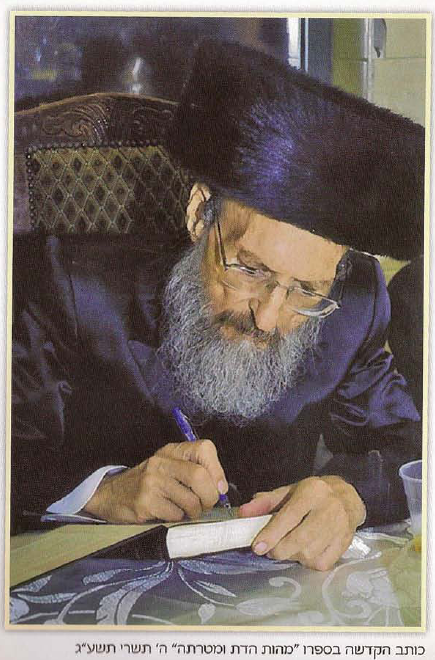 In the early years he clebrated the holiday together with his brothers-in-law, the righteous Rabbi Avraham Eliezer Segal, ZTZ”L, and also the righteous Rabbi Moshe Klirs ZTZ”L, and may he be remembered for a long life, the righteous sage Rabbi Mordechai Sheinberg Shlita. They would dance for many long hours. Right away with the end of the festivals, people around him would immediately see his missed the beginning of the holiday, but would right away start to converse and speak about the coming festival, similarly towards Chanukah and similarly towards every single festival. However, greater than them all were his preparations for the Passover festival. If in every home preparations for this festival were deep and arranged for many weeks, in his home preparations took place even more so. In fact, Passover preparations continued for almost the entire year, already a number of months after the previous Passover, he would already be beginning for the coming year the preparations including baking matzos, in order that there would be a place to bake the deluxe matzos and also for the “mitzvah” matzot for the night of the Seder night that he would try to eat only from them throughout the Passover festival. His work and striving in matters of baking the matzot cannot be underestimated. Even in the years that he was weak and suffering from his heart, he didn’t falter and continued to occupy himself with the yoke of the mitzvoth. He did not give up whatsoever from the utmost strictness and every mitzvah in its glory and stringency. And when he went out to draw the “Mayim Shelanu” (“resting” water with which to bake matzos), one could see the bursting happiness and longing for the mitzvot of the upcoming festival. In his great care over cleaning the house from every possible suspicion of leaven, he oversaw all the work together with the Rabbanit of blessed memory, and as the days of Passover drew nearer, took care that all matters of kashrus of foods and the rest of the needs of the festival in a particularly special way. For many years, he would invite for the Seder night many guests. This night that have great light, he would instill them with a faith in the blessed Hashem and draw them near to the Torah and the awe of heaven. With moderation and patience he would explain clearly every concept and action that took place during that evening. He would hold fast to every custom from the traditions of his ancestors and not agree to change even one, and would not allow to add or to change a single thing. Enhancing the beauty of mitzvoth was for every single mitzvah, whether it was the mitzvah of tzitzis or other mitzvoth, for everything he would not give up or cheapen to do this even if it cost him dearly. 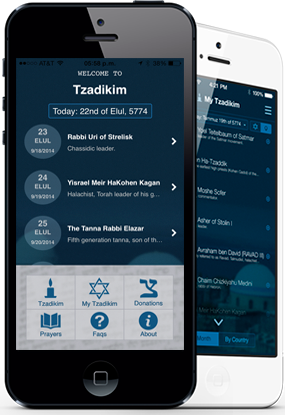 And especially the giving of Tzedaka, in which he was especially careful to enhance the mitzvah. It is impossible to guess or estimate the amounts that he would distribute. The needy would knock on his door and he would listen to them with compassion to their troubles and reward them politely. Organizations, yeshivas and every important activity for Torah merited to receive a fair portion from him. He was excellent in the virtue of Tzedaka particularly during his youth, and when one of his friends would relate from the days of his studies in the yeshiva of Amshinov, in the yeshiva he would distribute his allowance, and when he would receive the money, would rejoice and say that now he had in his hand the possibility to uphold the mitzvah of Tzedaka. The Admor greatly admired this and related this to the other students of the yeshiva so that they would learn from him and act accordingly. Generally, he loved Torah in a very deep way, particularly those who learn and toiled in it. He would entertain his grandchildren with Torah and Mishna. If he heard of a youth or a young man who was not doing well in his studies in a Talmud torah or in yeshiva he would invest great effort in order to assist and to draw him near and encourage him, and if necessary, he would provide financial help as well in order to encourage these children he would arrange with them a sort of contest in learning Mishna. The “Baal HaSulam” ZTZ”L wrote in his book “Matan Torah” (Gift of the Torah) that a person who has an internal connection to Torah has a certain connection also with the love of the land of Israel. Even he spoke at length about the honor of the land and cared for its spiritual condition and the needs of the people in it. He took to heart the situation in the Land of Israel, and was involved in every matter that that touched all. When he visited the U.S. a number of years ago, he was hosted in a luxurious home, very impressive in its size and beauty. He expressed his admiration of this, however, in the same breath commented to ask what they were looking for in the U.S., because there was no soul there. And so he would instruct his students and those who were close to him who were outside of Israel to move and to make aliyah to the Land of Israel. He supported them and assisted them with his own hands in order that they would become established financially and indeed, more than a few families took this step with his advice and merited to build their homes here in the Land of Israel. One very special matter for him was the honor of the fruits of the Land of Israel. At every opportunity, he would increase the praises of its fruits and their cultivation, and in particular on “Tu b’Shvat” on which he would discuss at length and with words of Torah on this subject. Over the years he used to visit and tour all over the Land of Israel. During these tours he greatly praised the Land of Israel. In his devotion to the teachings of Rabbi Shimon and the Ari Z”L, he would go a number of times each year to Safed and connect to the holy place. He would relate to a teaching from the great and holy rabbi “Baal Hameor Eynayim” who said that the word “sefer” "ספר" (book) in Gematria 240 is ‘שם’ “shem” (‘name’, ‘there’), and therefore, the essence of attaching oneself to the graves of a Tzadkim is the study of his books. He would make long preparation before the trip to the Tzadik and speak of topics in their teachings, so that when he arrived at the graves, he would only be delayed a short time. It is impossible to guess the greatness of happiness and the strength which he received when the book was published. He felt like he had fulfilled a purpose in life. It is worth mentioning that in this book he sought for everything a source in earlier books or in the books of the “Baal HaSulam” and did not want to write anything whatsoever that was his own. Indeed, not long after he was sick, and his body completely cleansed by the many extreme sufferings. He received them with a steady love and faith. His physical weakness was deep and with great self-sacrifice he did not, even in this period, give up carrying on his activities and the order of his days. He made extreme efforts to pray with a minyan. Despite his grave weakness, he continued giving lessons. In the last months of his life his strength waxed and waned until his strength was completely drained. On the last “Shabbat Mevarchin” (before a new moon) that he prayed at the Western Wall, he refused to start saying the blessing for the month because of his great weakness. 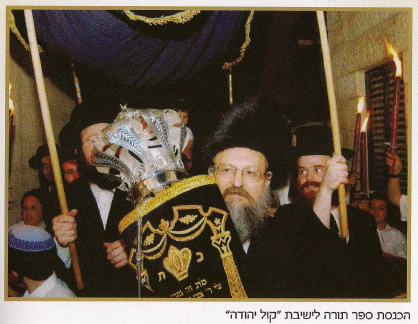 He was also afraid to hold the Sefer Torah, but the skilled Gabbai Rabbi Avraham Segal, Shlita, and those who were praying urged him and claimed that they were not able to give up on his monthly blessing, and advised that another man will hold the Torah. Suddenly, he girded the remainder of his strength and was upheld and requested to hold the Torah by himself, and began saying the blessing of the new month as usual. On Shabbat Tu b’Shvat, he went out for the last time to Third Meal and spoke about the topic of Tu b’Shvat, sublime and deep words. Also in those difficult days he did not cease to be interested in every single member of his family, about their needs and their situation in every single detail, and from his sickbed tried to assist and help many. On his last Shabbat, he stubbornly tried to stand up for Kiddush while wearing Shabbat clothes,even though a great effort was needed for that. All of this with tremendous self-sacrifice with a strength that was beyond human abilities. And thus despite the fact that he was not used to blessing children on Friday night, nevertheless on that Shabbat, he blessed his grandchildren who were at his side with the blessing that is written in the Torah. 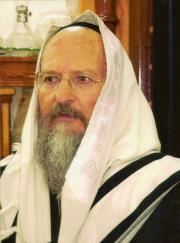 To the great sorrow of his family and students, his soul was returned on Wednesday, the 10th of Adar 5773, as pure and meritorious sou. Those who were surrounding him meriting seeing the purification of the body in a clear body until remained purely a soul that came out to the upper heavens leaving behind many to mourn his abcense from this world. He left behind him writings and recordings of novel insights in Torah and articles in many fields, among them, illuminating the spiritual worldview with his teachings and the books of the “Baal HaSulam,” a few of which have been included in this booklet, and G-d willing, will be published soon. At his funeral and during the days of “Shivah” many came, led by Admorim and rabbis, including rabbis from all over Israel, his family, his admirers and his faithful, who wept bitterly at his great loss and at the great void that was left behind when he was taken away from among us. He merited and left behind a splendid family, his sons, son-in-laws, and grandchildren, splendor of the legacy of their holy ancestors, who are continuing in the same tradition he built and linked in glorious splendor for eternity.